By Hadi Waqas in Desktop. Updated on December 9, 2017 . Getting dragged into a conversation while you’re working can be particularly annoying. This gets worse when the people that are having the conversation aren’t able to take the hint that you’re busy at the moment. If explicitly telling others that you’re busy doesn’t sit well with you, there is a Chrome extension called NOPE that may help you with that. Spotted by the folks over at Lifehacker, NOPE is an extension that functions as a "call-on-demand" button. 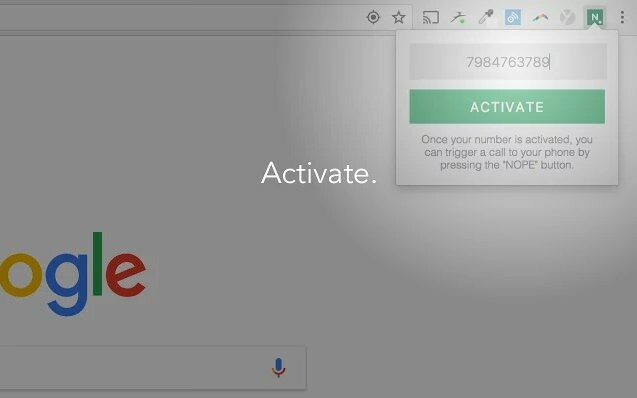 To use this extension, all you need to do is to activate your phone number with the extension. Once done, clicking on the NOPE icon will cause you to receive a phone call from a New York-based number. What happens after is simple: you pretend said phone call is important and request for some privacy, and the people holding the conversation would leave you to your call. Once they’re gone, you can return to your work in peace. The one requirement that NOPE has is that it’ll only work with a U.S.-based phone number, much like some other extensions that require a phone number to work. This means that the extension is unusable if you live outside of the States. For those who are able to use this extension though, we recommend using this extension in moderation, lest people discover your little tricks.